An essential book for anyone who has a prostate gland or who used to have one. A man’s prostate gland is a silent worker worker deep in his pelvis, alongside his urinary system, that contributes to his fertility. For many men, their prostate never announces it existence by messing with their bladder function (enlargement) or developing serious disease (prostate cancer). Treatment for prostate cancer can include surgical removal of the gland, nuclear radiation or powerful chemotherapy to kill the cancer cells or hormone suppression therapy to slow the cancer growth. All of these treatments come with potential side-effects that can be physically distressing, embarrassing, painful and life-changing but not in a good way. They may prolong your life but it might not be the life you previously enjoyed. Incontinence, loss of erectile function, fatigue, depression, pelvic pain and mood instability are all possible long-term partners. 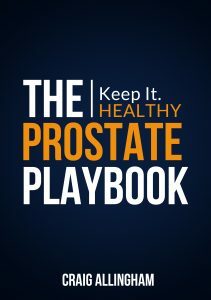 Written by a men’s health & Olympic physiotherapist with an inherited risk of prostate cancer and a professional career in high performance sports science and medicine The Prostate Playbook is a strategic manual for reducing your risk factors and improving your protection factors (defensive and offensive plays) to keep your prostate in the best health. Throughput – the effect of stress, fatigue and worry on your immune system which is your first line defense against cancer cells throughout your body and how to reduce the chemical imbalances that compromise your immune system. Yes – there is evidence that reduced stress, improved sleep patterns and mental re-framing of your cancer can reduce the likely progression of the disease. Input – everything you absorb into your body through drinking, eating and inhaling has the potential to ignore, suppress or drive your prostate cancer. Knowing what to avoid (smoking), reduce (red meat, sugar) or increase (cruciferous vegetables and anti-oxidant nutrients) and actually putting it into practice will tip the odds in favour of keeping any prostate cancer below treatment levels. Output – understanding that being active is not enough and you need to exercise to the point of training is vital. Craig covers everything from walking speed to resistance training and yoga as part of a prostate health lifestyle. To purchase this book online, click on the image above.